Uterine hyperstimulation is a serious complication of labour induction. It is defined as as single contractions lasting 2 minutes or more, or five or more contractions in a 10 minute period. It can cause impairment to uteroplacental blood flow and result in fetal heart rate abnormalities, fetal hypoxia and fetal damage. Uterine hyperstimulation is mainly a concern with induction of labour at term, and is a risk with all induction methods. A Cochrane systematic review by Alfirevic et al of 76 studies found that oral misoprostol (doses of 20-25mcg given every 1-2 hours) have the same hyperstimulation rates as other induction methods. This suggests that misoprostol can be a potential risk for hyperstimulation, but if it is administered in a titrated dose, the risk can be reduced greatly. This is, in part, the reason for the inclusion of oral misoprostol as one of the recommended induction agents in the 2011 WHO Induction of labour guidelines. Figure 1: Safe single doses of vaginal misoprostol for producing uterine contractions at various gestations. For the first trimester 800µcg 24 hourly can be safely used. In the second trimester 200µcg 12 hourly is a common dose, whilst beyond 24 weeks 25µcg 6 hourly is usually used. If a higher dose than this is used, then uterine hyperstimulation with uterine rupture or fetal distress might be the result. 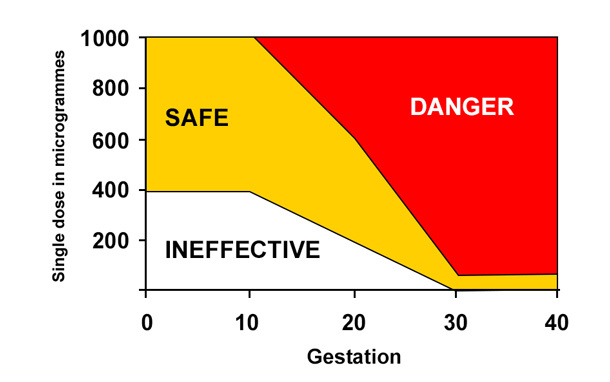 Misoprostol, like the vast majority of drugs, has potential adverse effects. The links below list the common symptom characteristics. This independent site has been set up to distribute dosage guidlines for the use of misoprostol in obstetrics and gynaecology. The correct dosage varies greatly according to gestation, indication and route of administration – using the correct dosage is vital for success and to prevent complications. Plenty of generic misoprostol preparations are available and are labelled for use for reproductive health indications. However Cytotec, the original misoprostol brand, was only approved for the prevention and treatment of gastric ulcers. Like many drugs, it can be safely used 'off label' for other indications. Link here for the debate and advice on prescribing 'off-label'. All medications have potential adverse effects. Read about the potential problems with misoprostol and how to avoid them.